Simone Brinkman: Override The Art House. Courtesy of the artist. After all, said Alice, what is the use of a book without…conversation? Being a bit Alice-like in my love of text I arrive at The Art House, Wakefield, ready to be plunged into Override, an exhibition by London based, Milanese born sculptor Simona Brinkmann. A simple handout is available if you want it, but otherwise it is straight into the space full of industrial materials. Tall metal poles are welded to white walls, strips of fur coated latex snake across the floor and the ripped wall of a rusty metal container has rough holes bored in it. There are strings of twisted black plastic rope, each knotted in an uneasy belly button of a punctuation mark. 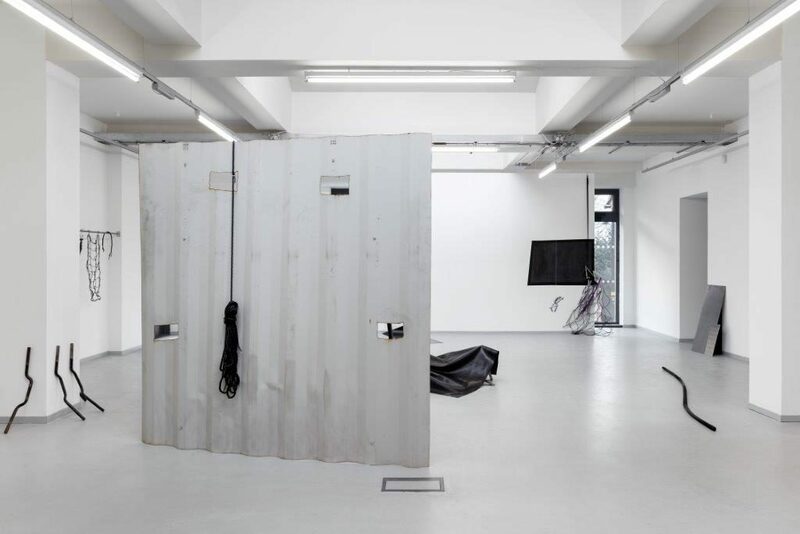 Brinkmann’s pieces, constructed at offsite welding workshops as part of her residency and self-curated in the white cube space, are neither pretty nor yielding. A fold-up metal chair painted in black anti-climb would mark you unforgivingly were you to sit in its lap. A suspended sculptural form constructed from found handlebars, makes us wonder where the body of the cycles went? And where are the cars from which two eerily soft, padded leather headrests came from? Punctured with leather-covered buttons, one painted black, one a dull tan, the headrests suggest nothing so much as a missing head. Scavenging in scrap yards, Brinkmann brings a wooden palette into the space and lashes a chair to it with rope. In the corner, a flickering strobe light faces the wall like a naughty child. Ellie Collins: Sweepings, The Art House. Courtesy of the artist. Next door, Ellie Collins’ Sweepings lie on office flooring. There are enormous dusters in soft yellow flannel, disembodied sweeping brushes and scraps of leftover materials. A video playing ambient noise quietly in the corner provides the incessant, repeated sound of the brush moving across and back on the flooring, never completing its task. Enormous dust balls nestle at the edges of the room, on radiators and ledges, and, somehow finding a life of their own, have rolled out onto the decking beyond the confines of the exhibition space. Escaping into the Wakefield afternoon, they possess a subversive energy that also pulses from Brinkmann’s Ballard-esque pieces. Collins too provides just a short simple handout. I am beginning to understand that as viewers, making our own conversations with the difficult and challenging work (that is being produced so bravely and diligently by, in this case, mature women artists) is in itself part of the process of engaging with art. Simona Brinkmann: Override, The Art House, Wakefield, 28 March – 11 May. 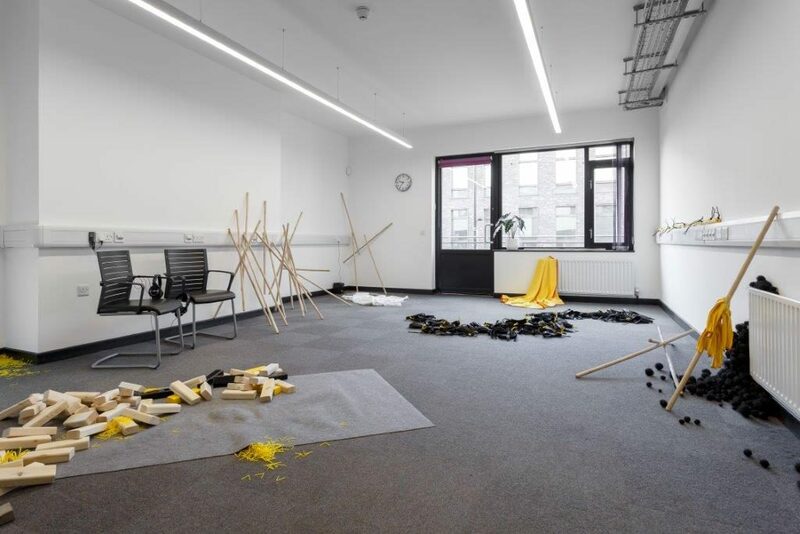 Ellie Collins: Sweepings, The Art House, Wakefield, 28 March – 13 April.